Delays DLC until you meet certain requirements, no more quests and messages as soon as you step out of Doc Mitchell's house. Radio starts broadcasting at level 20, listen to start the quest. Radio starts broadcasting at level 10, listen to start the quest. Radio starts broadcasting at level 15, listen to start the quest. Ulysses sends you a note at level 25, read it to start the quest. The quests will also start when you discover the entrances to the DLC areas. If you're playing a Tale of Two Wastelands, check out Gribbleshnibit8's Delay DLC TTW. Other modifications that improve the intro and DLC implementation. Personalizes and partially randomizes the starting equipment Doc Mitchell gives to the player in the tutorial section. Unfortunately incompatible with..
Streamlines the start of the game to get the player out of Doc Mitchell's house smoothly and quickly, without skipping it entirely. 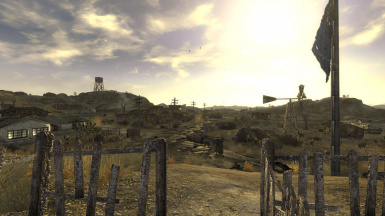 Gameplay overhaul that also distributes the Courier's Stash DLC throughout the Mojave so that you don't start with enough loot to sustain a small town militia. Distribution overhaul for ammo variants, mods, reloading parts, and weapons. Integrates the Gun Runners' Arsenal DLC in cleaner way. Removes message boxes that pop up during the tutorial, as well as one-time help pop-ups, repeating corner-messages. Restores and improves the scene where Victor pulls the player out of the grave, after playing the vanilla intro video.